There’s more health care drama in Congress this week, which we’ve written loads about lately: See a partial list here for anything you might’ve missed. An interesting question is why Congress is in such a rush to get the Affordable Care Act, aka Obamacare, repealed. Part of the answer lies in taxes: Because of complex legislative rules, the GOP needs to get rid of certain health expenses before it can cut billionaire’s taxes by the methods it wants to use in Congress. One special tax they’ve got in the crosshairs is the estate tax, which is exclusively paid by millionaires and billionaire. But as Chuck Collins explains this week, urban-dwelling fat cats are using an unusual prop to explain their opposition to this modest levy on their fortunes: America’s small farmers. You should read it to believe it. Meanwhile, Razan Azzarkani looks at the big money behind an effort to undermine another pillar of modern democracy: internet freedom, in the form of net neutrality. Also this week, Oscar Reyes explains how Europe is racing ahead of the U.S. toward electric cars. Jim Hightower reports on a Koch-convened millionaire summit in Colorado. And Jill Richardson compares two recent beach experiences to show what a difference even small public investments can make. 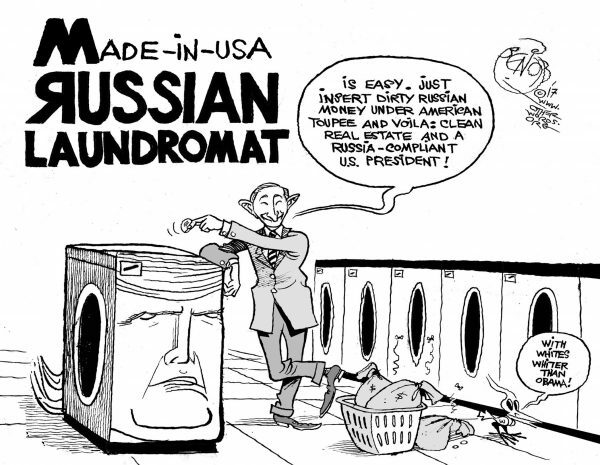 Finally, Khalil Bendib takes another whack at the still simmering RussiaGate scandal. Broadband companies want the government to let them control the internet as we know it. And they’ve got help. Who needs roads when you’ve got a private jet? Stories about the heroism of strangers can restore your faith in humanity — but strangers are no substitute for public servants.